Save $200 on this high-end display. If you're looking for a monitor upgrade, Best Buy has one of the best deals we've seen for Acer's nifty XF270HUA, a 27-inch IPS panel with Adaptive Sync support. This monitor normally sells for $500 (Newegg) to $600 (Amazon) but is currently marked down to $400. In addition to supporting Adaptive Sync, which means the monitor can work with a FreeSync graphics card for smooth gameplay, it has a fast 144Hz refresh rate, low 1ms response time, and 2560x1440 resolution. 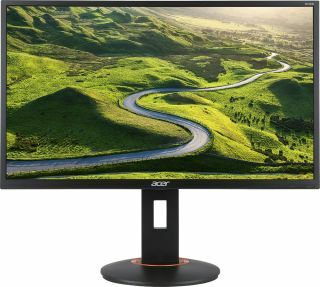 According to the monitor's product page on Acer's website, it has a brightness rating of 300 nits (Best Buy lists it at 350 nits), which is pretty average. Acer does not mention anything about color accuracy, though being an IPS panel, it should stay more faithful to how things are supposed to look versus a TN panel. It also boasts generous viewing angles of 178 degrees (horizontal and vertical). Other features include a pair of built-in 2W stereo speakers, four USB 3.0 ports, two HDMI inputs, and DisplayPort connectivity.